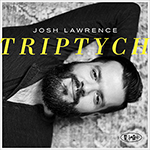 The tasteful trumpet stylings of Josh Lawrence add color to the scene while listeners are encouraged to keep their focus on the frames of "Triptych." Employing a wide palette of tones and sounds, this gifted instrumentalist makes a bold statement of purpose with both his stunning musicianship and his combined presentation of three unique original minisuites on his third album for Posi-Tone. Lawrence's melodicism shines throughout the session with able assistance of some of the hippest cats on the scene today, including the collective brotherly genius of bassist Luques Curtis and pianist Zaccai Curtis, the drumming excellence of Anwar Marshall, and scintillating sounds of alto saxophone sensation Caleb Curtis. With this latest release, Lawrence not only confirms his status as one of the biggest rising stars in jazz today, but also shows that he is clearly a visionary musical artist for jazz fans to keep their eyes fixed upon for years to come.